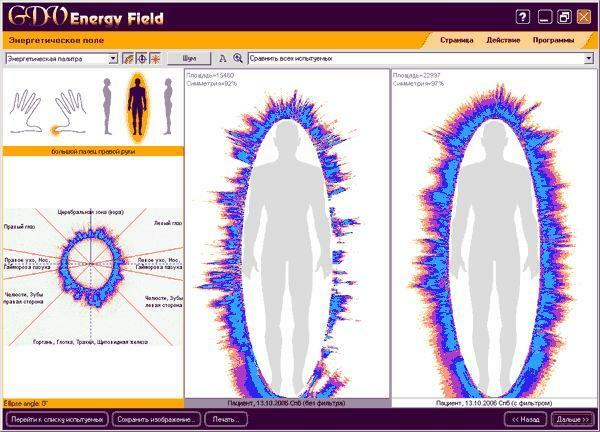 The GDV Energy Field program is designed to process GDV image and build a model of human energy field using the information obtained from 10 GDV images of human fingers. Creation of energy field is based on a diagnostic map showing a correlation between the areas of glow of separate sectors of fingers and different systems and organs of the human body. The GDV Energy Field enables to view the human energy field as an image around the human contour and to represent it in tables and diagrams in a numeric form. The program also makes it possible to calculate the following parameters of the energy field model: area, entropy, fractality and symmetry. printing out GDV-images of energy field, tables and diagrams.